In January, we had Karen Fann, President of the Arizona Senate and owner of a construction company that works in the public works industry, as our speaker. She shared with us some of the initiatives they will be exploring this legislative session - many of which involve investments in the public infrastructure here in Arizona. If you've looked at the recent Washington Report from APWA National, you might have noticed some encouraging reports on legislation to help fund enhancements to the water and transportation infrastructure across the nation. All of this is great news for our industry. Studies have consistently found a direct correlation between investment in public infrastructure and increased economic activity and growth in our communities. Taking care of what we have is as important as adding new to accommodate growth. In March, National President David Lawry, PE, a former Public Works Director himself, will be at our luncheon to discuss with a panel of local elected officials the importance of asset management in helping to keep our communities strong and viable. As our local communities move through their budget processes lets us individually and as an association help remind all our elected officials of the VALUE of public works in sustaining the quality of community life we enjoy here in Arizona. Topic:"Value Engineering - What's In It For You?" What are you responsible for in your new role? Engineering in the City of Yuma is responsible for delivery of the CIP, Traffic Engineering, and Development Engineering. We have our own in-house survey and design teams and provide extensive support to the City’s development and legal teams as well. My staff is 28 strong, including 10 PEs, 2 EITs, 1 RLS, 1 LSIT and a host of inspectors, surveyors and engineering technicians. What Challenges do you experience in your role? We are significantly underfunded in Yuma to meet the needs of the community, so that is a big challenge. Also it is very hard to recruit to fill vacancies here (currently have 3 openings, two of which are now going on over 9 months). Have you served on the Board or any committees? I have served on two different International Congress & Exposition (now PWX) organizing committees, including co-chairing the Volunteers committee in 2015. I am currently serving as the Chapter’s Alternate Delegate. What benefits do you get out of being a member? For me one of the biggest benefits is the networking and relationship building. I have resources all over the state, and in some cases other parts of the country, who I can reach out to for advice and information. I also appreciate the wide variety of educational opportunities APWA makes available to us. What would you like to share with APWA Members? Mostly to stay engaged, and enter every APWA opportunity with an open mind. 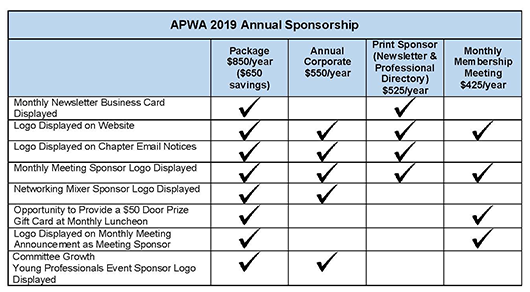 There is such a wealth of knowledge among APWA members, and they are thrilled to share with you if you are open to receiving it. Tell us about your family and hobbies: My wife Sharon and I have 4 amazing daughters between 27 and 19, and one granddaughter. Our girls have collected 3 bachelors and 2 masters degrees, one has a PhD in progress, and one is completing her application for Physicians Assistant school. They are my pride and joy (of course the one who went to the U of A is my favorite – shhh). Hobbies, hmmm. We like to go bowling and have been known to keep many greenskeepers employed with our golf abilities. Mostly I am a pretty voracious reader and am always looking for new learning opportunities. We are looking for our 2019 sponsors! Check out the flyer below for some great opportunities to be recognized as an Arizona APWA sponsor. Please contact Sandy Niebel with any questions. 602.335.8530. At this writing of the 54th First Regular session of the Arizona Legislature there have been 749 bills and 44 memorials introduced. A press conference was held during the week of January 21-25, with the family of Officer Clayton Townsend, the Salt River police officer that was struck and killed by a distracted driver while using a cell phone, to SB 1165 was introduced to prohibit texting while driving which enacts a statewide ban on using cell phones while driving. The recent death of Officer Townsend has re-energized the discussion on distracted driving, leading to a total of five proposed measures ( SB1165, HB2069, HB2165, HB 2537 & SB1141) introduced that may lead to the passage of a statewide ban this session. To find additional information go to www.azleg.gov; Search under bill numbers listed above. Last year’s legislation session passed HB2166 vehicle fees; alternative fuel VLT; allowing the director of the Arizona Department of Transportation (ADOT) to set a highway safety fee that would cover 110% of the costs to fund the state’s highway patrol budget. There are numerous bills in the legislature attempting to repeal the fee this year due to the misunderstanding of the amount to be charged. The Legislature was told by Joint Legislative Budget Committee (JLBC) the fee would be $18 per vehicle instead of the current published fee of $32 per vehicle. There is never a shortage of legislative bills to track – for APWA members we suggest following legislation surrounding the Drought Contingency Plan (DCP) - Without the legislatively-approved framework in place by Jan. 31 to allow the director of the state Department of Water Resources to join with the other Colorado River Lower Basin states in the plan to manage future allocations from the river in an ongoing drought, Arizona will invite federal intervention to exert greater control over our water destiny, school procurement (HB 2310) repealing the low bid process that was passed in 2018, Education funding, increased fuel tax bills, and regional transportation sales tax authority. Stay Tuned, we will be back to provide you a progress update as the 54th First Regular Session continues.